Last year’s Halifax Gold Medal Plates gala was tempered by the edge of an Atlantic hurricane blasting horizontal rain against the Cunard Centre (in spite of which a very good time was had by all, if you remember). This year, the weather was a model of decorum – the merest balmy zephyr of a breeze, autumn sunshine glinting on the waters of the great harbour. And once again we had a terrific party with a sell-out crowd of 600 guests who seemed reluctant to leave when all was said and done. Spurred on by our most eloquent, witty and learned emcee, Scott Russell, our posse of Olympic athletes told tales of Rio and medals won. And the music totally rocked, thanks to the ever-splendid Jim Cuddy, the dashing Danny Michel, the incomparable Anne Lindsay and those mighty millennials, Devin Cuddy and Sam Polley. And the food? The same curious impulse that determined no Alberta beef would be offered at Edmonton’s GMP gala last week (three seafood dishes reached the podium there) was at work again in Halifax. Tonight, every chef worked exclusively with meat – the single exception a moment of cod tongue garnishing an ox tongue confit. Are lobster and fish not to be had in Nova Scotia? Not last night, at any rate. But the gastronomical standard was higher than it has ever been at this event – the unanimous verdict of the judges. Allow me to name them, starting with our Senior Judge for Halifax, writer and restaurant columnist Bill Spurr of localexpress.ca; chef, author and educator, the Kilted Chef himself, Alain Bossé; sommelier, educator and passionate culinarian, Amy Savoury; chef and educator, currently the Hospitality chair at the Nova Scotia Community College, Ted Grant; chef and local gastronomy advocate Jason Lynch; and, of course, last year’s Halifax Gold Medalist, Chef Martín Ruiz Salvador of Fleur de Sel in Lunenberg. 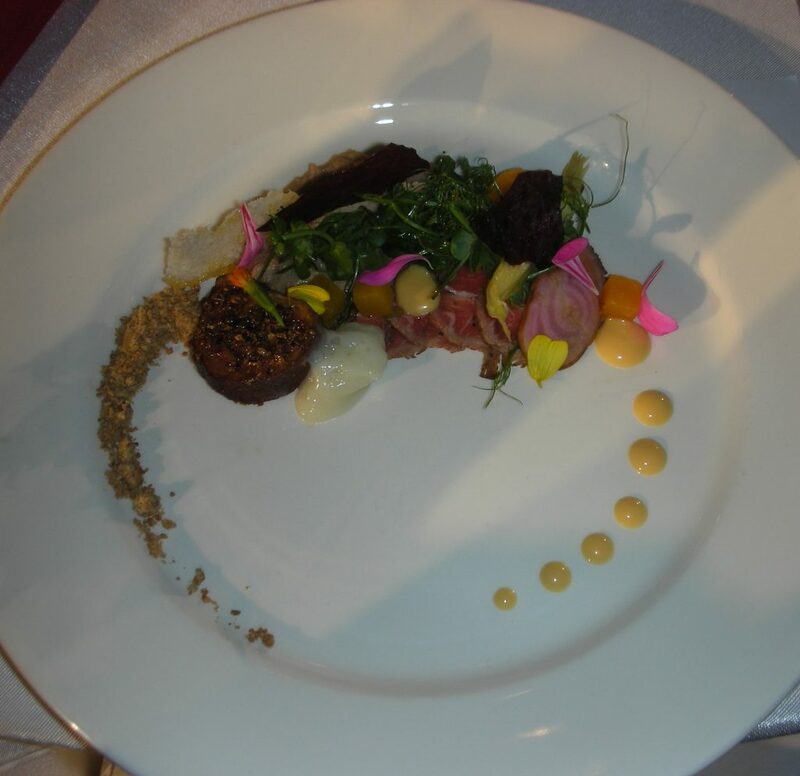 Chef Ardon Mofford of Governors Pub & Eatery won the bronze medal with an astonishingly beautiful presentation of local Margaree lamb. He gave us a wee drum of the loin, maple-glazed and seared, dainty slices of smoked carpaccio, and a tangy rillette of the confited shoulder, leg and neck that was blitzed then smeared across the plate. A medley of pickled Hank’s Farm root vegetables provided all sorts of delicate colours and dainty shapes – squash, green onion root, and watermelon radish – some sliced, some diced. Crisp, tissue-thin shards of blueberry wafer added a fruit component while diminishing dots of caramelized white chocolate oil followed the curve of the plate, ready to serve as a nicely judged condiment with the lamb. Balancing them prettily was a horn-shaped bank of “sunflower dirt” made of powdered sunflower and fennel seeds with a hit of juniper. Completing the picture was a fragment of rosemary sea-salt crostini, as thin and crunchy as Melba toast. Chef Mofford paired this lovely dish with a unique beer, a joint venture of two breweries from opposite ends of Nova Scotia – Big Spruce from Nyanza and Boxing Rock in Shelburne. Called For the Love of Grimace, the brew was a clean, crisp sour beer flavoured with fresh blueberries, a very refreshing choice. Less than half a percentage point separated our gold and silver medallists. Taking silver was Chef Luis Clavel of CUT steakhouse who used PEI beef of spectacular quality and baskets of mushrooms to create a truly stellar dish. 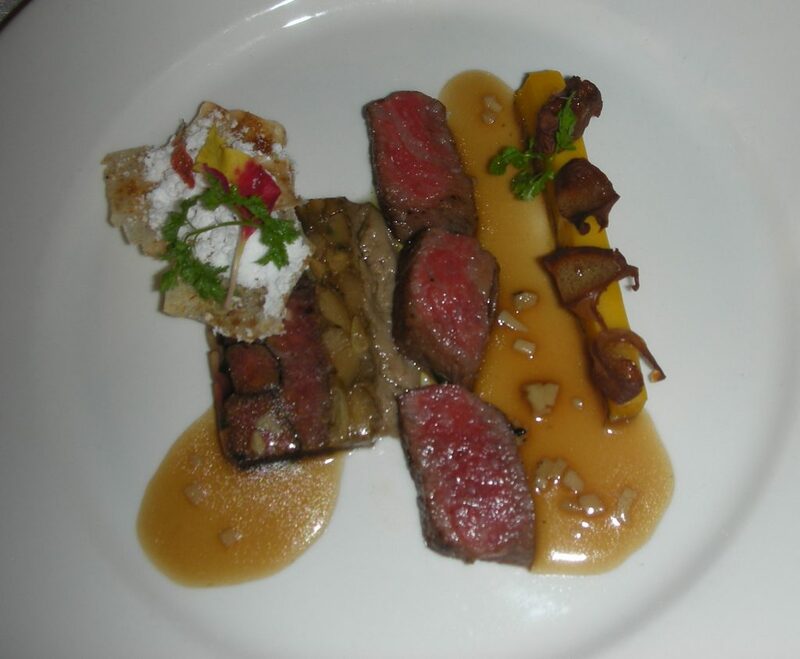 At its centre were three pieces of perfectly seared ribeye steak – tender, juicy and flavourful. Beside them was a slice of a terrine that layered beef rib cap with porcini, separated by strata of foie gras and carrot ash. The third component was a technical tour de force – a slice of butternut squash pudding like a firm purée, topped with tiny pickled chanterelles. Amplifying the umami, a streak of compressed chanterelles on the plate had the texture of a smooth duxelles while an unctuous demiglace made from the rib bones was flecked with motes of Australian truffle. For a final crunch, Chef made a cracker from dehydrated beef tendon, turned into a wafer then fried so that it ended up like a chicherone, and topped with truffle powder and edible flower petals. The dish’s wow factor was off the map and the wine match was a good one – the layered flavours of meat and mushroom finding neat affinities in the ripe, sophisticated depths of Stratus Red 2012 from Niagara. 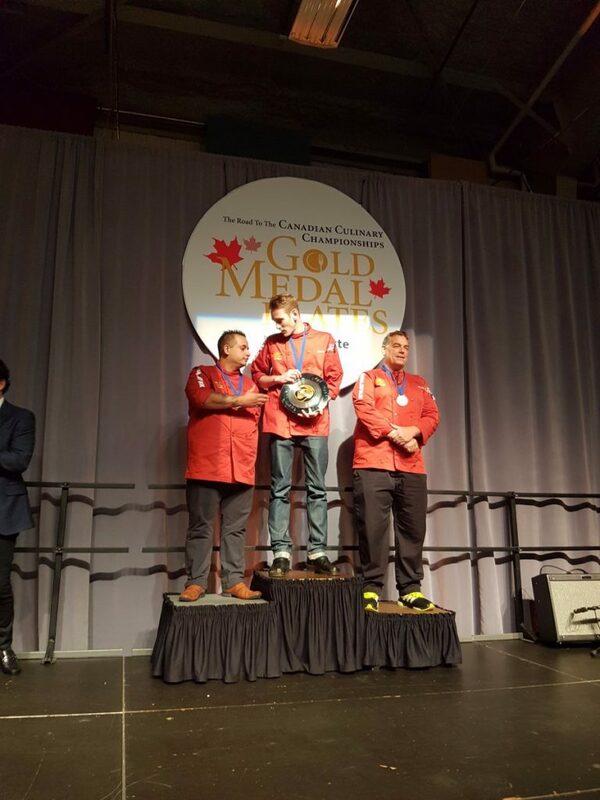 Our gold medallist was Chef Mark Gray of Battery Park Beer Bar & Eatery who decided to showcase and share his passion for charcuterie. 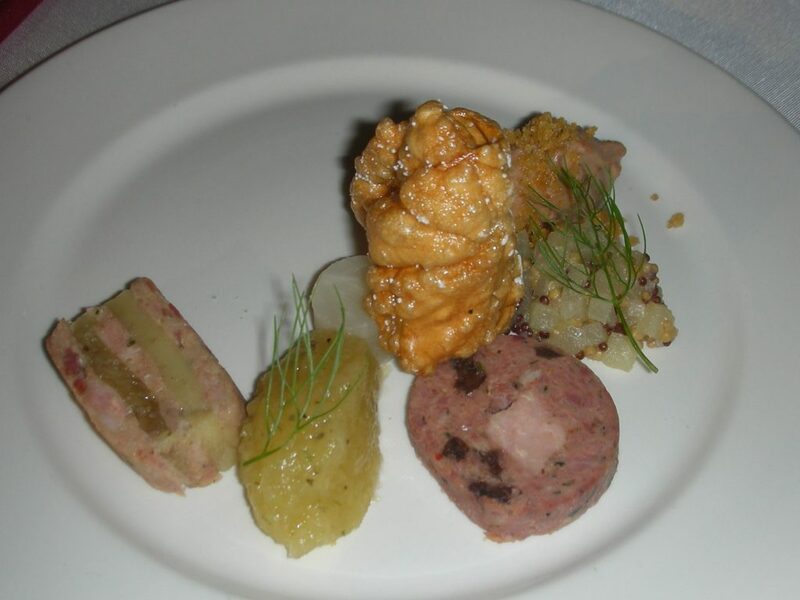 A local Berkshire pig, fed on goat whey, provided the wherewithal for his three chosen elements. First was a quenelle of intensely flavourful, silky mousse made from the pig’s liver enriched with foie gras and topped with a scattering of crunchy toasted breadcrumbs. Close by lay a slice of a firm paté with a matrix of the ground shoulder meat surrounding an inlay of tenderloin; dried cherries had been stirred into the farce to contribute a pleasing, fruity tang. The third component was a terrine of the moist, tender pork belly layered with apple and also with soft fennel. Various accoutrements served to enhance and garnish the charcuterie. Here was a gentle mostarda of diced apple and mustardseed topped with a frond of fennel weed. Over there lay a mound of gorgeous fennel marmalade – and there a pale cylinder turned from a tangy fermented white beet. Almost stealing the entire show was a crisp, lightweight cracker made from a pork bone stock that Chef reduced, turned into a dough, steamed, dried and ultimately fried. The judges were so impressed they sent for more of them from Chef Gray’s station, just to make sure the consistency was consistent. What to pair with such delights? Chef created a cocktail that he could adjust and fine-tune to everything on the plate, starting with three fermented teas (one black, one white, one green) flavoured with fermented wild apple, oak chips and spruce tips gathered and preserved last spring. A splash of gin from Ironworks Distillery in Lunenburg turned it into a beautifully layered cocktail with a fine balance of acidity, apple tannins and a mere hint of sweetness. Congratulations to all the chefs who competed and our thanks for a deliciously memorable evening. Tonight we will do it again in Regina! The fun never stops.